The palliative tendencies of conventional cinema configure audience as patient, filmmaker as pharmacist. The patient arrives, wearily, with his prescription, ready for the cure. The pharmacist officiates, moralizes on proper usage and dosage, translates the cryptic scribbles. He reminds the patient to get plenty of sleep. The pharmacist keeps regular hours, closed on Sundays. The alchemist has no such customers, or concerns. The alchemist looks for the illumination of base objects; she communicates telepathically with other practitioners; she wakes late in the day, wondering, “did I really?” remembering the brief, dark glow cast against the laboratory wall. With the common goal of exploration through moving images, 12 Montreal-based artists have conspired to become the Double Negative Collective. We find ourselves in the role of the alchemist: we promote accidents, discoveries, and failures; processes that lead into unknown landscapes; the fleeting tangibility of mystical and transformative forces; and the begetting of delicate, precious objects in the dark. We locate cinema in human experience, in the eye, hand and heartbeat, not in the worn-out tropes that pass for meaning and feeling in conventional moviemaking. We find mystery in processes: in materials, in ideas and in the world. The untutored, discovering camera is the prism we have found to draw these forces together. We are choosing, through experiments in form, voice and vision, to initiate a dialogue long-neglected in the independent artist-based filmmaking community: a benevolent conspiracy of ideas. For this, we have gone back to the roots of the media of film and video to ask questions and seek answers. Film art is at a turning point in the world of cinema. There is a loss of vitality in the independent avant-garde filmmaking scene in Montreal and its filmmakers, more often than not, are willingly relegated to lesser cohorts of the commercial film industry. The double negative film collective is a dynamic group of emerging and established practitioners who reject the traditional forms of cinema and emphasize the creation of a new, formal, and personalized vision of the moving image. We strive to create, promote and disseminate films on a smaller scale filled with personal vision, artistic ingenuity, and experimental sensibilities. We are geared to revitalizing the exhausted forms of cinema and develop the possibilities of a new visual language. As emerging artists, we extol the importance of a body of work for the artist and the collective itself. Our work serves as alternative to the complacent, passive viewer and will shed new light to the stale, traditional forms of cinema. In re-examining past concepts and re-interpreting future possibilities, the double negative film collective stresses the need for an expanded form of cinema, exploring the interaction of moving images and professing a postmodern re-mixture of the celluloid and the electronic. 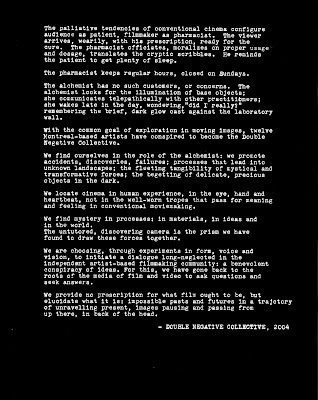 Double Negative Collective is a Montreal-based group of film, video and installation artists interested in creating, curating and disseminating experimental film. Founded in 2004, the collective seeks to locate cinema in human experience, in the eye, hand and heartbeat. Through experiments in form, voice and vision, they try to initiate a dialogue long-neglected in the independent artist-based filmmaking community; a benevolent conspiracy of ideas.